Yojiro Terada has become something of a Le Mans institution: this year’s 74th running of the great race marked his 27th 24 hours of Le Mans. This quick trip through the lengthy Le Mans career of Terada San comes to you courtesy of 16 year old Heather (daughter of Bill) Binnie. Whilst Terada has seldom been up at the sharp end of the results, his extended period of competition at Le Mans has seen many revolutionary changes to the race, the track and of course the cars. 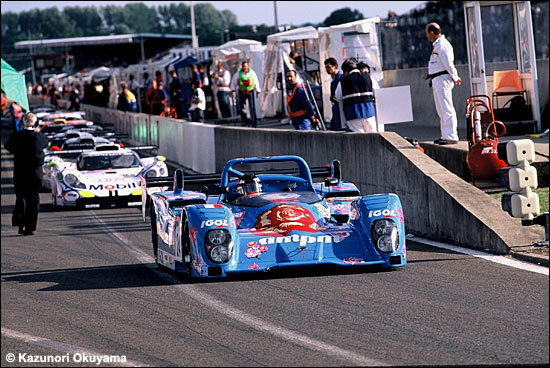 Terada's first Le Mans 24 Hours was in 1974 when he raced a Mazda RX3. The car finished but did not complete enough laps to qualify for classification. The Mazda therefore went back to the drawing board, the company seeking to design a better car. In 1979 the factory was back with a modified Mazda RX3 but without Terada. The car was still off the pace and failed to qualify by a fraction of a second. The Mazda factory were not amused and refused to come again until it was sure that it could produce a competitive car. Terada's favourite Le Mans so far was in 1982, his third outing but the first when he would post a finish, this time driving a Mazda 254 prototype. The finish however was anything but simple. With twenty minutes left to go, his car ran out of fuel a mile from pit lane, at the Porsche Curves. Thanks to poor radio communications, Terada was stranded with only the marshals’ help. He slowly pulled to the side of the track and the marshals parked his car in a safe place. He got out of the car with “my heart in my mouth" and watched as his competitors passed by, just laps away from the finish. Over the next 18 minutes, Terada "didn't know what to do" and his mechanics were nowhere in sight. With two minutes to go, the marshals convinced him to try and start the car. So he put his helmet back on and got back in the car. Thanks to “some miracle the car started" and he was able to cross the finish line and receive his first of many chequered flags. His mechanics were not expecting his reappearance and hence they missed his dramatic finish but they were close by for the celebrations in the pit afterwards. In 1991 the Mazda works team came to Le Mans with high expectations after a long and successful off-season test programme. 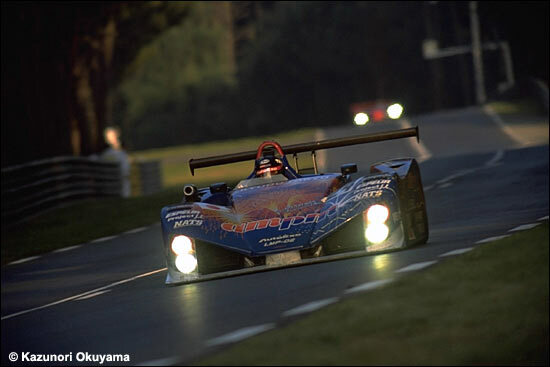 The team had made many technical changes and fielded a trio of cars, Terada driving a Mazda 787. Terada was a practice driver for the factory during the 1970s, ‘80s, and early ‘90s and spent about 20 days of every month at the factory, running different cars on the local racetrack in preparation for the season ahead. For 1991 the factory had made some dramatic aerodynamic changes to the cars increasing their speed and reliability. The results were exactly what the factory wanted, all three cars finished and one famously took the first (and so far only), overall win for a Japanese factory team. The other two cars finished sixth and eighth (the car that Terada was driving). It was the perfect ending for all of the hard work that the Mazda crew had put in over the last year. However, it would be the last year that the works team would contest Le Mans. 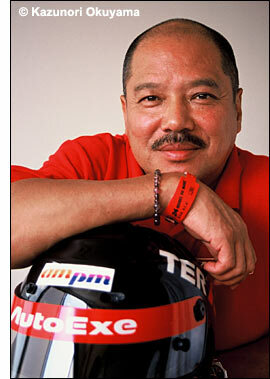 In 1992, with no works team drive available, Terada still came back, but this time with a Mazda privateer team. It was the start of a series of successful runs aboard privateer Mazdas. In 1994 in a Mazda RX7 he placed second in the IMSA class and in 1995 he placed seventh overall. 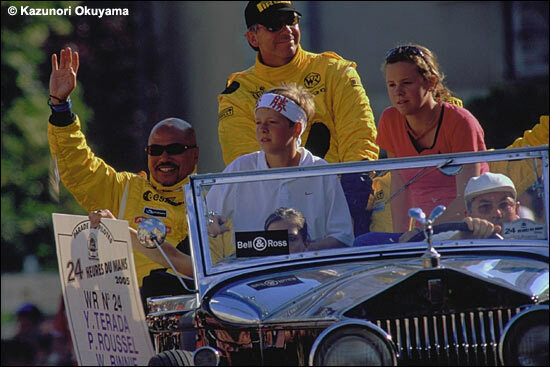 1996 and 1997 saw him racing a Mazda-engined car at Le Mans with the help of Jim Downing. This would be the last Mazda car that Terada would race for half a decade but that didn't stop him from returning to Le Mans. In 1996, he was a class-winner, in LMP2, and in 1997, the same trio finished 17th overall. 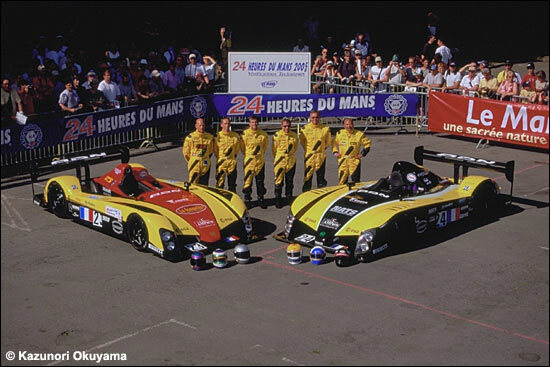 During 1998 and 1999 Terada returned to Le Mans driving a Courage C50 and a Riley & Scott / Autoexe LMP99. He finished fourth in class in the Courage but didn't finish in the Autoexe LMP99, a car named after Terada's own company, Autoexe, a car parts manufacturing company in Japan. 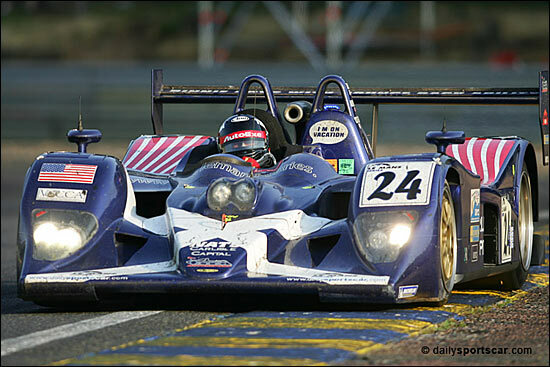 For the 2000 race he started for the small, local WR team in their LMP 675 car. 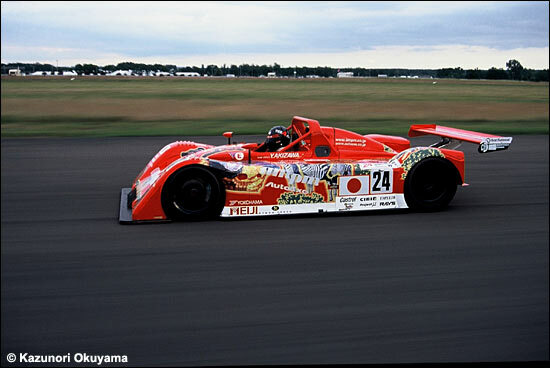 The relationship immediately found success, finishing well in their class in both the 2000 and 2001 races but in 2002 Terada decided to return to Le Mans with his own team, this time with a Mazda engined WR chassis. He didn't finish and returned to the WR team for 2003. After another DNF the car was changed substantially. Aero changes and engine reliability work proved successful when the team finished second in class during 2004. Terada was enjoying his association with the team but by 2005 the car was feeling its age and though the team posted a finish, the car was unclassified. That's Heather Binnie, enjoying the drivers' parade at Le Mans for the first time. 2006 saw Terada race a British built car for only the second time: the Team Binnie Lola Zytek would prove to be fast and reliable and, in his 27th race, Terada once again stood on the podium, and second in the hotly contested LMP2 class would be his ninth class podium, a total which includes three class wins. Terada admits that his years with the Mazda factory "squish together" in the memory but those days still remain firm favourites after years of working so closely with the factory back in Japan. For him being a test driver taught him the "tough competitiveness" he needed to be a good racecar driver. As a boy Terada dreamed of being a Formula One "superstar" like his hero and friend Jacky Ickx, but the Mazda factory didn't have a Formula One team so instead competed in endurance racing. In general, he "loves to learn" and says that the day he stops learning from his engineers and competitors will be the day he stops racing. For him the best co-drivers are those that are "gentlemanly" and understand that Le Mans is "an endurance race not a sprint race". All of his experience has taught him that "qualifying isn't really important", all that is important is to cross the finish line at the end. 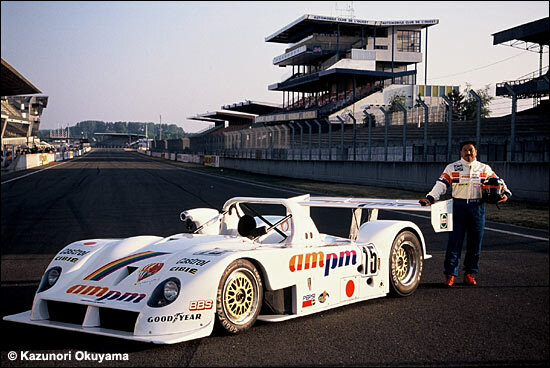 Terada is one of the rare drivers still competing who raced Le Mans along the Mulsanne straight before the introduction of the two chicanes in 1990. Before the addition, the straight was Terada's favorite part of the course because the "speed (reached along the straight) was thrilling". However, "every year there was a big accident" so he understands the added safety feature and thinks that in general it is much better. The added chicanes forced many "cars to get faster, quicker" and any technical changes that occur throughout motorsport Terada strongly supports, so he was willing to compromise his favorite part of the course for safety. Terada's Le Mans experiences would not be complete with out his infamous "Arnage lady" story. Near the Arnage corner, alongside the Le Mans track is a little house, and in 1985 there was a beautiful Arnage lady who had a huge Mazda sign in her front yard (garden). She caught Terada's attention with the sign and over the whole 24 hours she cheered his every lap. To keep his attention, she changed her outfit every six hours and each time she changed, her clothes became increasingly noticeable. For example her first outfit was very plain with jeans and a Mazda t-shirt but her last outfit was very bright with a head dress. 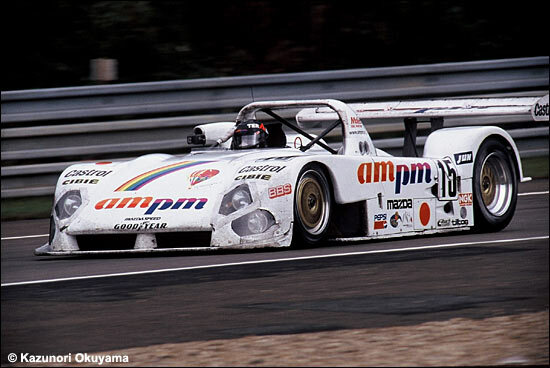 In 1989 Terada returned to Le Mans and sure enough his beautiful Arnage lady did as well, except this time she was pregnant. She held the same Madza sign and changed her outfit regularly. The next year, as Terada passed the white house his beautiful lady cheered him, except that she was now accompanied by a bouncing baby on her hip. This lady had such beauty and such an impact on Terada that in 1990 after the race, at which his lady hadn't attended, he took his interpreter and went to visit the house. A different lady answered the door and explained that normally the family had a family reunion each year at Le Mans, and that the lady who held the Mazda sign was her aunt. In 1989 and 1990 the family reunion didn't take place so the beautiful Arnage lady hadn't come to the race. Terada thanked the house owner and left but in 1993 the story of the beautiful Arnage lady was turned into a TV movie in Japan. Terada is not only popular at Le Mans but also back in Japan, thanks to everything that he has accomplished on the racetrack. He has a fan club that comes to Le Mans every year but more importantly he does everything he can to support motorsport in Japan. He started a school for race mechanics, and every year he takes the two best mechanics from his school and invites them to Le Mans, where they work with the other team mechanics. This way they get to experience first-hand what it feels like to be a part of a proper race team, putting their schooling to work. In Japan Terada is an official representative of the ACO, transcending the role of driver to become an official too. He still looks forward to Le Mans every year and says that his fans are a huge part of what make the whole experience special. Whilst good finishes are still the objective, there is one major target remaining. He hopes one day to break the record of the most Le Mans ever participated in, currently held by Henri Pescarolo with 33 race starts.